MARFA, Texas — Opponents of a pipeline under construction in West Texas are pleased by the national attention garnered by protest against the Dakota Access crude oil pipeline in North Dakota. Construction there has been at least temporarily halted following months of protest. 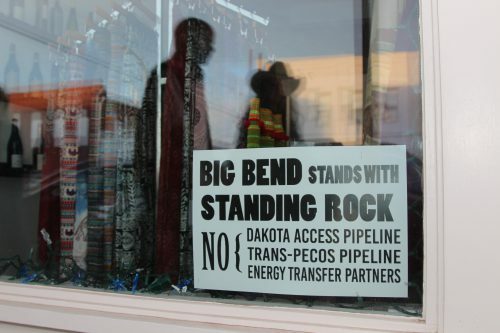 But many people in West Texas are frustrated that it has taken a recent ruling by the U.S. Army Corps of Engineers halting the work in North Dakota to bring national attention to the Trans-Pecos Pipeline in Texas. In North Dakota, the Standing Rock Sioux and other Native Americans and their allies attracted widespread attention from both the national media and from Wall Street. The Sioux’s reservation is near Dakota Access. They said the pipeline could threaten their water. Months of protests and rallies have for now translated into a megaproject stopped as it is relatively close to completion. Coincidentally, a Dec. 13 pipeline leak spilled significant amounts of oil into a creek approximately 150 miles from the Dakota Access protest encampment at Cannon Ball, North Dakota. The spill is the kind of development that opponents of the Dakota Access pipeline point to as an example of the kind of accident they fear. The Trans-Pecos pipeline has been paid for by Mexico. The route, the most direct and therefore least costly path from the natural gas laden Permian Basin of Texas to the border, was selected by Mexico. It was then approved by the State of Texas. Mexico says it needs the natural gas to power electricity plants. Energy Transfer seized her land using the power of eminent domain which Texas gave to the company. To date, Simpson and numerous others have not received compensation owed them under eminent domain law in Texas. Simpson is one in a group of landowners that was the target of legal action by Energy Transfer Partners-Trans-Pecos Pipeline, LLC. In 2016, six landowners won a series of awards totaling in the millions of dollars, awarded after the pipeline company sued the landowners. A seventh case was adjudicated in favor of the company. The landowners are part of a larger group of approximately 40 people or landholding entities contesting compensation offers and who have retained legal counsel. Energy Transfer Partners-Trans-Pecos Pipeline LLC said in an emailed reponse for this story that it is appealing the verdicts against it. The company also said in the same email exchange that that it has offered fair compensation to landowners. Landowners and others interviewed for this story claim otherwise. But Simpson said the North Dakota ruling is welcome here. Since the Dakota ruling, Native Americans in Texas and their non-Native allies have gathered a number of times the perimeters of the Trans-Pecos Pipeline. “You live on this earth! You need this just as much as we do!” exclaimed Native American Aaron Tellez to pipeline construction workers. Speaking of preserving land, which here includes some of the last legacy ranch land in the United States, he said “Let’s take care of her!” The incident was captured on video by independent photojournalist Jessica Lutz. Energy Transfer has said it respects the right to peaceful protest. In North Dakota, any rerouting of the pipeline means Energy Transfer would have to get easements from property owners in other parts of North Dakota, who might say “not here,” an echo of voices in Texas. “I thought there would be enough people out there that love the Big Bend and realized its majesty and its significance to Texas and the United States. And I thought, I guess foolishly, that all we’d have to do is sorta put it out there and say hey this area’s at risk. And the fact that that didn’t happen was very disconcerting,” Keller said. Both pipeline controversies are also on the radar in Mexico. Pipelines bringing in U.S. natural gas are lynchpins of the country’s energy reform program, a plan that propses cleaner electricity generation through the use of natural gas rather thsan oil, a more stable supply of electricity and lower prices for businesses, manufacturers and consumers. The price and delivery of electricity are particularly irksome issues In Mexico. In 2017, four U.S. natural gas pipelines begin delivering to Mexico. In the next three years, U.S. pipeline capacity into Mexico will nearly double. José Manuel Carrera heads business development at Pemex, Mexico’s state-owned energy company. He did not comment specifically on any individual pipeline. But he said Mexico is counting on timely delivery of U.S. natural gas. This entry was posted in KRTS News and tagged Big Bend Region, Dakota Access Pipeline, Energy, Energy Transfer Partners, Environment, Infrastructure, Natural Gas, Oil and Gas, Trans Pecos Pipeline. Bookmark the permalink.